With the advent of LTE-U and LAA, Wi-Fi may face radical change -- or will it? In its latest editorial report, RCR spoke with Verizon, Cisco, Ruckus, the Wi-Fi Alliance and others to explore the status of the Wi-Fi ecosystem and its near-term future, including the latest standards work and increasing speeds. Download 'The Future of W-Fi' editorial report. 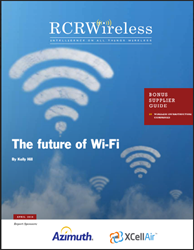 RCR Wireless News spoke with experts across the Wi-Fi ecosystem for their views on the future of Wi-Fi, including Wi-Fi Alliance, iPass, Aerohive, Cisco, Boingo Wireless, Ruckus Wireless and Wi-Fi Now, to get a thorough update on the state of Wi-Fi and its evolution. The report, entitled “The Future of Wi-Fi”, contains insight into the latest standards work and deployments of carrier-grade Wi-Fi; the ongoing evolution of Wi-Fi services in the home; and monetizing Wi-Fi based on better leveraging visibility and analytics as well as for service provider churn reduction. It also explores the convergence of Wi-Fi and LTE cellular systems, including the controversy around the use of LTE in unlicensed spectrum and industry concerns over LTE/Wi-Fi coexistence. Click here to download this free editorial report.